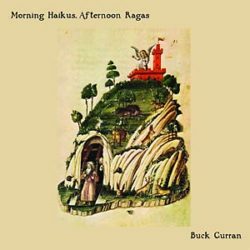 On Buck Curran’s second solo album, Morning Haikus, Afternoon Ragas, the emphasis switches to acoustic guitar, as compared to his first solo album, Immortal Light (ESPDISK 5014CD/LP, 2016). Side A, all solo acoustic instrumentals, seems to have fallen out of a wormhole emanating from Takoma Records in the 1970s. There’s some of that on side B as well, but there are also vocals and other instruments, sometimes overdubbed, and the dedication of “Taurus” to Peter Green, guitarist extraordinaire of the original lineup of Fleetwood Mac (when they were a blues band), hinting at the breadth of Curran’s influences. The introduction of other timbres and textures doesn’t diminish the intimate, almost meditational mood, though. Co-released by ESP-Disk’ and Curran’s own Obsolete Recordings. Personnel: Buck Curran – vocals, guitars, harmonium, flute, banjo; Adele Pappalardo – vocals on “Dirt Floor”. Mastering by Harris Newman at Grey Market Mastering.